A free networking event for minority and woman-owned businesses to learn about opportunities to do business with the city and local contractors. Expand your network of contacts -- and of potential business partners -- at the M/WBE Mixer. The Mixer is an informal way to get to know others in the business community who need your products or service -- and who have products and services that you need. Make sure you bring plenty of business cards! Open Networking to meet fellow business owners along with representatives of the Winston-Salem Chamber, the Winston-Salem Black Chamber, the City of Winston-Salem, the Winston Salem Urban League, Davenport Engineering, the Access Center for Equity & Success, and others. Open to all. Construction Trades Speed Networking. Move from table to table for short, seven-minute one-on-one meetings with general contractors and engineers who use subcontractors. Registration required BY APRIL 30, space is limited. City Department Speed Networking. Move from table to table for short, seven-minute one-on-one meetings with city departments that purchase goods and services. Registration required BY APRIL 30, space is limited. Hosted by the City of Winston Salem's Office of Business Inclusion & Advancement in partnership with the Winston-Salem Black Chamber, the Winston-Salem Chamber of Commerce and the FTCC Small Business Center. From the 2018 Mixer: "I established potential business relationships by attending the Mixer. I would attend this event again in the future." The 2017 Winston-Salem Mixer took place on January 10 at Wake Forest Biotech Place. The networking event allowed small businesses, minority-owned businesses and woman-owned businesses to learn about opportunities to do business with the city and local contractors. 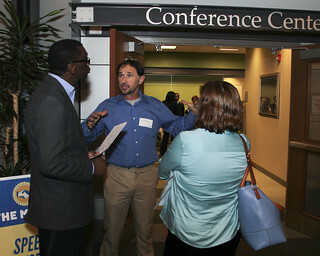 Click the picture below to see more images from the mixer, or view our Flickr album.